Making something veg-friendly is just too hard. They can starve or bring their own. Weirdos. We’ll make some stuff we found online. A few side dishes or maybe a Tofurkey loaf if they live near a store that sells one. If your family is like the first, and you just kind of tell your relatives or friends you can’t be bothered with them and they’re on their own, I guess the question is: Why are you inviting this person? It sounds like you don’t like them very much. And they certainly won’t feel loved or welcomed if they show up at a holiday event that’s essentially a big meal and there’s nothing for them to eat. Besides, it’s super-easy to make some side dishes that both vegans and meat eaters can enjoy. You need some potatoes — white, red, golden, Idaho, purple, fingerling, baking, organic… Doesn’t matter. Use what’s handy, what’s on sale, your favorite… And in whatever quantity you’ll need to feed your clan. You’ll need an oil — olive oil, vegan “butter,” or non-dairy margarine. You’ll need a dairy substitute — sour cream, soy, almond, hemp, or coconut milk, or maybe”buttermilk” (a cup of milk substitute and a tablespoon of lemon juice). Cut up the potatoes and boil them until they’re soft. Drain and dump into a bowl. Add enough oil, “dairy,” and herbs/spices, as you mix or mash either with an old fashioned masher or an electric mixer. Note: This isn’t so much a recipe as a “choose your own adventure.” Still, this guide isn’t just great for the vegan at your table, but it’s tasty (if you don’t tell them, the meat-eaters might not even know, however if you have gluten-free people, you may want to check the ingredients lists on any substitutes you plan to use) and it’s perfect for your lactose-intolerant friends and family. This can be made a million ways, but here are some options. You can use stale bread you might already have around the house (both Arnold and Nature’s Own have sliced breads that are vegan and you probably didn’t even know it — just doublecheck the ingredients for “dairy,” “honey.” or “eggs”). If not stale, cut or tear up the bread and toast it. You can buy pumpernickel or rye (or both), cut it up, and toast it on a cookie sheet. You can buy vegan stuffing in a bag (this one tastes the most like “Stove Top” and similar). You need some broth. The easiest two are Imagine’s No-Chicken Broth or Edward & Son’s bouillon. You need something crunchy (carrots, celery, onion, almonds). Herbs and seasonings like thyme, sage, rosemary, garlic, parsley, etc. If you’re using potatoes, boil those separately. If you’re using vegan sausage, crumble and fry that up separately. If you’re toasting your own bread, do that separately. In a pot, add water, broth, a little of your oil choice, onions, and herbs/seasoning. Bring to a low boil. Toss the bread in a big bowl with the cooked potatoes and/or sausage, then pour the cooked broth mixture over. Stir or toss to coat. Bake if you want the top crispy. Again, you can add and subtract to create the perfect stuffing for you. My sister uses the bag stuffing, faux sausage, and potatoes before baking it into a puffed pastry she weaves like a salty-haired Martha Stewart (my sister’s a surfer and a diver and an environmentalist). I’ve done a marble rye with cranberry and almond slivers. I’ve done pumpernickel with potatoes and celery. I’ve done the bag mix with onions and broth. Go nuts. Butternuts and Acorn squash make great centerpiece dishes and are pretty easy to do. Cook up some rice or quinoa and toss with herbs and soy crumbles or panko or chopped sweet potatoes and stuff your squash’s insides before cooking. Maybe just slice and scoop (think jack o’lantern prep) and then fill it with your vegan stuffing before baking. 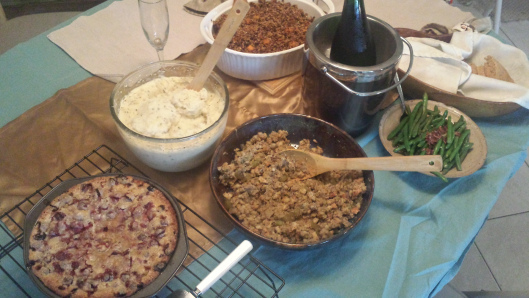 Almost every family has peas or green beans or something on the table come Thanksgiving. It’s not that hard to toss a serving or two of frozen peas in a pot with a little water and olive oil and pepper.